Kaviarasu Munian (2017, December). Amolops larutensis (Boulenger, 1899). Malaysia Biodiversity Information System (MyBIS). Retrieved April 22, 2019, from https://www.mybis.gov.my/art/188. Amolops larutensis, commonly called the Larut Hill Cascade Frog or Larut Torrent Frog, is named after Bukit Larut and was described by G.A. Boulenger in 1899. The Larut Torrent frog is so-called because of its ability to live along fast flowing streams and waterfalls, clinging to big wet boulders using its finger tips which can be dilated into large disks. This frog is considered a common and abundant species, distributed throughout Peninsular Malaysia and southern Thailand (Taylor, 1962; Berry, 1975). Six families of Anurans (frogs) are found in Peninsular Malaysia and A. larutensis is placed under the family Ranidae (true frog). The male is able to grow up to 45 mm whilst the female can grow bigger, reaching up to 75 mm. The size of the frog’s tympanum is usually about one-third the diameter of the eye. The skin of the frog is fairly granulated (above) with some flat enlarged tubercles on the sides of its body. Normally the frog appears pale yellowish green in colour with dark blotches on its back. 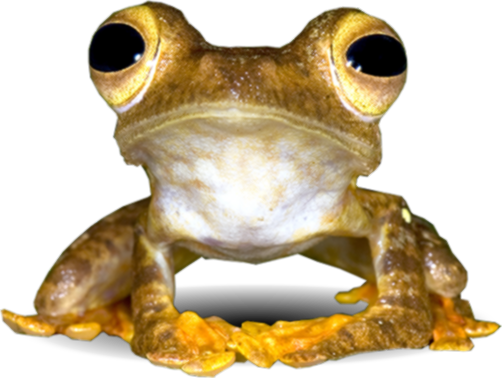 Its limbs are covered with black bars and the ventral part of the frog is smooth and white. The tadpoles of A. larutensis have large ventral suckers which aid in attaching them to rocky surfaces. Amolops larutensis can generally be found resting on big wet boulders and bedrock in and along fast-flowing clear water forest streams and is able to live up to 1500 m above sea level. Both the adult and tadpole A. larutensis play important roles as bio-indicators for stream quality where they are usually found only in pristine streams. The frog is categorized as least concerned (LC) under the International Union for Conservation of Nature (IUCN SSC Amphibian Specialist Group, 2014) but is protected under the Malaysian Wildlife Protection Act 2010. Citation:- Kaviarasu Munian (2017, December). Amolops larutensis (Boulenger, 1899). Malaysia Biodiversity Information System (MyBIS). Retrieved April 22, 2019, from https://www.mybis.gov.my/art/188.